Thank you all for your patience in hearing from us! The past few months have been very busy but we praise God for a lot of great things happening in the kingdom here in Togo! Forgive us for being behind on our updates, but we hope you enjoy the update and are encouraged by all that is going on. Please make sure to read through to the end, we have an update about coming to the US to see you all as well! Last year God blessed us to host a team from Park Avenue Church of Christ who performed eye consultations and share the love of Christ with the people of Vogan and surrounding villages. 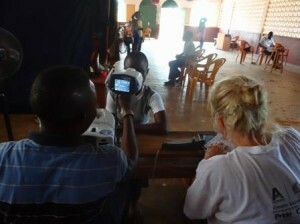 This is huge as there is such a need in Togo for eye care. We were so excited when we were able to host the team again this year. 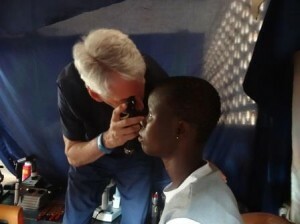 Dr. Clay (the Optometrist who came last year) returned again this year to help us minister to the Togolese people. However, we also faced some difficulties in the ground work of the team coming. Originally it was our plan to have Dr. Burlingame, an experienced cataract surgeon, come to Vogan to perform cataract surgeries on the local Togolese people. When we had seen the people in 2016 there were a large number of people who had cataracts that needed to be removed, some even on both eyes. Dr. Burlingame was going to be working with Mercy Ships and come to Togo to help us with our goal of restoring sight to these people. However, we faced a lot of challenges in working to obtain authorization from the government here in Togo. In the end, our request for surgery was not approved, but they did approve the eye consultations. It was frustrating to say the least, but God always has a greater purpose in mind. We did learn a lot through this process and made a lot of great connections that will help us in the future we believe. We were glad though, that Dr. Burlingame was able to spend some more time working with another Togolese surgeon in Lome where they both were able to continue to improve each other’s skills. Dr. Burlingame was able to continue to learn more about a surgical technique he can use in countries of limited resources and technology, and the local surgeon was able to learn much from all of Dr. Burlingame’s expertise clinically from years of practice. 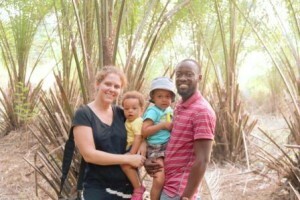 So, we praise God that his skills were still used to help the Togolese people, even though it may have been different than how we originally planned. The eye clinic started in Vogan after some delay as well as all the bags did not arrive with the team! We learned in so many ways through this trip that our time is not God’s time and God will always open the doors when it is correct! We praise God though that we were able to continue with the eye clinic. Dr. Clay, Brenda Holland, Chris Slaughter, and Mitzi Powers worked tirelessly and wonderfully in partnership with our local mission staff here. It was amazing to watch the teamwork. Our local staff too spent time with each patient, sharing Christ and praying for them. What a praise to see the physical and spiritual needs being met simultaneously. Even in our clinic we see great needs for eye care every week, so their return this year was such an answer to prayer for us. 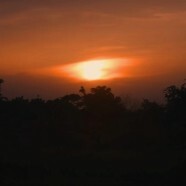 Some severe cases were seen too that we are now able to work with a local eye doctor for continued treatment as well. 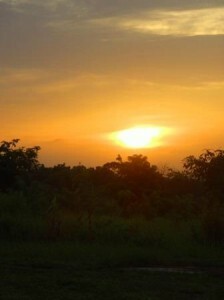 We are praying and planning on how we can still work with the local people to take care of the cataract surgery needs. Please pray for wisdom and opened doors with us. We praise God for all He is teaching us and leading us through and how He receives greater glory through the work of His servants! In the Month of May we were also able to host a team from Indiana that was a joint team from two different Universities, University of Southern Indiana (USI) and University of Evansville (UE). God always works in amazing ways to connect his workers throughout this world. We came in connection with this team as Kellar Stem is now the lead campus minister at University of Southern Indiana. Kellar was also Sara’s Campus Minister at ECU and has been a long-time encourager, supporter, and friend of our ministry and Dovene and Sara. We were able to visit these two universities during our last time in the US and it was such an encouragement to see the discipleship and outreach going on at both campuses. 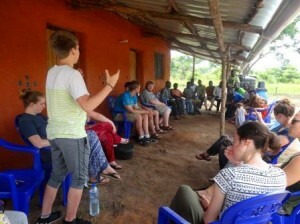 In spending time with the students, there began to be an interest in a short-term trip coming to Togo. Plans went forward and they were able to come this year! We had a group of 9 students (also including Kellar’s daughter Ashleigh) and 3 staff (Kellar Stem, Kristen Uhr (Also on staff at UE), and Rochelle Beckman (also on staff at USI). The team arrived and were ready to go. It was a joy to minister alongside this team during their time here. They came prepared to “story” with us. They had practiced “storying the Bible”, the method we use here in our simple Church approach. When we visited different places, whether it was patients, idol priests, farmers (out in the community by the farm outreach) they were ready to share and did! God’s word never returns empty, and God’s spirit was definitely moving in the people’s hearts who heard these stories. While visiting in Totsoani, the village that we have been reaching out to, there were two individuals who came who were very intent listeners and participators. It was like they had questions that had been burning in their hearts about following Christ for some time, and the team and Dovene spent time just going through things one by one with them, and there was much joy in their continued learning. I will write more on this in the next section below, as the follow up is a story in itself. Another patient’s sister, Mama Ataka also is definitely seeking now and was very encouraged by the stories we shared with her. As our medical team continues to clean her sister’s wound now Sara and her staff continue to share with her, and are praying that she comes to repentance. She has said she is ready but she is still finding excuses about why the time isn’t right for her. The decision is hers alone, but we continue to share truth with her and pray that she will listen to Christ calling. This team was such an encouragement to us as well. We love seeing students and their leaders on fire for Christ, and praise God for how they are discipling where they are at in life too. We pray God would continue to impact those who have had seeds planted through this group and that God would use each person of this team to impact his Kingdom greatly wherever they are in life. 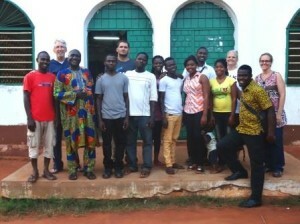 The past few months have been really great to watch God at work in the hearts of the Togolese. In one of our previous updates we wrote about possibly moving out of Totsoani due to the people there having heard the truth of the gospel but not moving to repentance. Since we stopped the weekly storying there Dovene has still been going to visit them occasionally and keeping up with them. When our group from Indiana came to visit they also went out to visit with Dovene and it was during this time that the two guys showed up who had many questions and great enthusiasm in learning more about following Christ. After the group left, Dovene had set up a date to follow up with them and they were actually saying they would be seriously considering baptism on that date. On the way back from the airport Dovene called the man who had shown a passion and enthusiasm to confirm their meeting time the following day. The man actually asked if the group had left a “gift” for him on their departure. Dovene asked what he meant by “a gift” and the man implied that he had expected money of some sort. Dovene informed him they had not, and the man actually said it was Dovene’s fault that they didn’t that Dovene should have encouraged them to give him a gift on their departure. Dovene was surprised that this was his response, but reminded him of the joy that he felt as they were all answering his questions about following Christ, and how that was one of the greatest gifts anyone could ever give. He let him know that our trips and visits would not be about financial gifts and the like, but that we would be focused on discipleship, truth, and the message of salvation. He let them know we would still be there to meet the following day if he was ready, and asked him to also let his friend Julien know about the meeting time. He said he would. The next day Dovene and Sara headed out to Tostoani to meet up with Alfred and Julien. On our arrival, no one was there. Dovene asked around and they said Alfred had not come but that Julien was working nearby so we asked someone to call him. When he came he told us that Alfred had not confirmed with him that we were coming but that he was not sure where Alfred was either. As Julien was supposed to be at working in the farm, we asked if we could share one passage with him quickly. We shared the passage from Matthew 25 about the 10 virgins, some who were prepared for the bridegroom and some who were not, and how the bridegroom comes unexpectedly and those who were prepared went with him but those who were not he did not even recognize to let them in later. You could visibly see the story impacting him. When we dug deeper into the meaning of it you could see him seriously thinking. We explained to him that just like in this story we can always think there is another “tomorrow” to come to Christ but we never know when it may come. Also, that we cannot force anyone to be ready, they themselves must make the decision to follow Christ. He asked us if we could go with him to the field nearby, that his friends were working there too, and he would love for them to hear this story as well. We agreed and went with him. In the field nearby there were five men working fast clearing the field and a lady sitting under a nearby palm tree. Dovene greeted them and Julien explained our purpose for being there. Dovene then kicked off his shoes and grabbed a hoe and started working alongside them for a bit, and started telling the parable at the same time. The men loved that he joined in the work with them, but soon became engrossed in the story that they asked Dovene to stop so they could ask many questions. We discussed many matters in that field that day, and it lead to an invitation to return the following week in their house to continue learning. So for the past few weeks we have been meeting in a nearby village to Tostsoani in these men’s house. We have been going through several passages and it has been well received but at the same time there has been some definite spiritual warfare coming from other members of this community that has been difficult at times. We feel like there are some serious seekers in the group. Alfred has never shown up again. We are meeting in his village with his other friends, so it should be fairly simple for him to come if the true desire for truth was there. We share the details of these stories so that you will also help us be in specific prayer for the oppositions we face here. Please keep praying against the distractions and opposition we are facing during our meeting times here and that those coming would come to a true repentance. We will never cheapen what it means to be a true disciple, and so if after going through the cost of discipleship with them, they answer the call of Christ we are excited to see the impact that it could have on a community that so needs the gospel. Felix and Brittany are Married! We also had a great reason to celebrate this past Sunday. Brittany Creasy, our teammate who has been helping on the field in the medical ministry the past two years, celebrated her marriage to Felix Attikpo, one of our mission staff with our Church family! We are so excited for them and know they will do great things in the kingdom of God together now, as they both have great servant hearts! We have been able to witness their relationship growing over the years and we know their marriage will be a great testimony to the Togolese people as well. 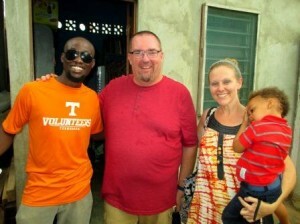 Currently their plans are to remain in Togo to serve while working on paperwork to move to the US together. Please be in prayer for them that God would bless, protect, and guide them in their marriage and open all the right doors for their paperwork. It is coming to the end of a two-year term here in Togo and we are now making preparations to come for a visit to the US. We are looking forward to fellowshipping with you and updating you all on what has been going on the past couple years here in Togo. We are also hoping to make new contacts as the mission is in need of new partners as we continue to grow. Originally it was our plan to try to come in early June, but we had a complication with the fire case out at the farm. They gave a final court date in early August, which Dovene would be required to be at. If we tried to go at this time it would make it very difficult to try to make the most out of our trip as there are many people and Churches that we need to make contact with. However, since we had already made a few obligations for July we did not want to delay everything to August. So we have made the decision that Sara will be going to the US mid-July with the children and Dovene will be following up early August after the fire case is finally settled. This will allow us at least to be able to represent on the current obligations we have made but Dovene will still have to be at the final hearing in court in August. We plan to be in the US through the end of October. So please pray for us as this has been a very busy season for us. God is moving in so many ways, but it is often that there is not enough hours in a day to get everything done! Please pray for us in preparations for traveling as there are many things both here (simple church, clinic, farm, house) and for our travels that need to be accomplished. We are also asking our friends and supporters if anyone might have a vehicle that we might be able to borrow for three months during our time in the US. Getting around to visit supporters and Churches can be a challenge, and renting a vehicle really adds up very quickly. We could travel to pick it up and would take excellent care of it if someone would like to help fill this need for us. If you would please pray with us for this provision, as it will definitely impact how we can reach everyone on this trip. The second need is that we are thankful to those who have given to help us with plane tickets but we are also still in need of $1,600 for Dovene’s plane ticket this August. With Hannah and Nathan both needing to purchase “child seats” because they are over 2 years old at the time of our trip has also caused an increase in the price of our airfare this trip. If you would like to contribute towards this need information can be found below on how to donate. So in conclusion we are so excited to see you all but covet your prayers over all of this. We will be in contact with you all to try to catch up with each of our supporting Churches and supporters, but please also feel free to reach out to us at this time too! God opening a new door and a person of peace in Julien to meet and disciple others so that they may come to Christ! Being able to start storying and meeting in the farm area as well! More info will be in our next update on this as well! Blessings of Supplies for the Clinic brought by the Park Avenue Church of Christ Team, and Indiana Team (who also carried stuff from Lake Christian Church, VA)! We were struggling as our donated supply had dwindled down, and it has been a great blessing! God added another year to Nathan’s life on June 23rd! We have been blessed with four years of this sweet strong boy! Prayers for the new discipleship group. Pray that there will be repentance and that they will follow Christ whole-heartedly. Pray against attacks of Satan and the distractions he is trying to cause during our meeting times. Prayers for Dovene and Sara’s trip to the US. Please pray for Sara and the children’s travels as she will be going with the children by herself on the way to the US. Please also pray that God will direct us in all of our travels and that He will continue to provide for the mission through His people. Pray that our visit will be an encouragement as well to those who are already giving selflessly to the mission! 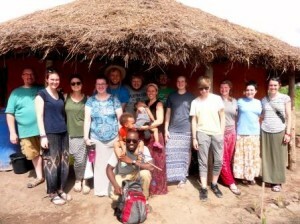 Prayers for provision of transportation for Dovene and Sara while they are in the US. They will be traveling to several Churches and individuals while there that are in different locations and are praying that someone might have a vehicle they could be able to use during this time. Please pray for the fire court case (where someone set fire on the farm) that is to resolve in the beginning of August.